Toronto Blue Jays' Aedmys Diaz is met by teammates Kendrys Morales and Lourdes Gurriel Jr. after he hit a three run home run against the Tampa Bay Rays in the first inning of a game in Toronto, on Sept. 5, 2018. What did the Toronto Blue Jays get for their star third baseman, just three years removed from American League most-valuable-player honours? Apparently, a 26-year-old pitcher coming off Tommy John elbow surgery, who has yet to play a single major-league inning. Meet Julian Merryweather who, according to unconfirmed reports, will be the player to be chosen later in last week’s trade, which sent Josh Donaldson to the Cleveland Indians. At least the pair have one thing in common. Donaldson is also recovering from an injury – a calf strain that put him on the shelf in late May. The Blue Jays have yet to publicly confirm that Merryweather is the swap for Donaldson. The confirmation is unlikely to come until the season ends. The 6-foot-4 right-hander, who was Cleveland’s fifth-round pick in the 2014 draft, underwent elbow surgery in spring training, sidelining him for the season. In 2017, splitting his time between Triple A and Double A, Merryweather was a combined 7-9 with a 5.32 earned-run average. He does possess a fastball that has been clocked at 97 miles an hour. Blue Jays manager John Gibbons said before Wednesday night’s game against the Tampa Bay Rays at Rogers Centre he had no idea if the rumours regarding Merryweather were true. He had weightier matters on his mind, such as trying to figure out why Rays’ pitching has dominated his team this season. Heading into Wednesday’s game, the Blue Jays were on the verge of a dubious distinction. They had five or fewer hits in each of their past seven games against the Rays, which is tied for the longest streak against one opponent in the live-ball era, which began in 1920. To add insult to injury, their .169 batting average against the Rays this season is their lowest against any opponent. And it is not as if the Rays – although they have enjoyed a good season this year – are a powerhouse. It just seems that way whenever they play Toronto. “So, we need six hits?” Gibbons said before the game, without a hint of a raised eyebrow. The Blue Jays got that – all in the first inning – as Toronto (63-76) steamrolled Tampa Bay (75-64) 10-3 to prevent a three-game sweep against a division rival. Toronto scored seven runs off six hits in the first inning against Tampa Bay starter Tyler Glasnow, who had only two outs before heading for the showers. Toronto finished with 16 hits. The big blast in the first came off the bat of Aledmys Diaz, a three-run home run, his 17th of the season. Billy McKinney also homered for Toronto, his fourth. September minor-league call-up Rowdy Tellez made his major-league debut for Toronto with a pinch-hitting assignment in the sixth and collected a run-scoring double. Kevin Kiermaier had two home runs for Tampa. 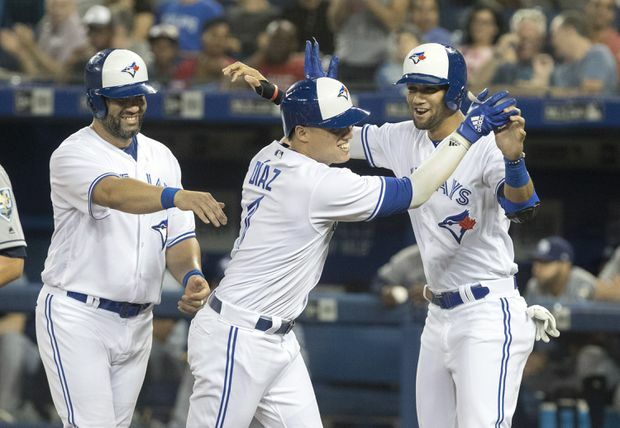 The seven runs tied Toronto’s largest single-inning outburst this season, equalling the seven they scored against the Chicago White Sox on April 3 in the eighth inning in a 14-5 Blue Jays win. Stroman could not even get out of the second inning in his last outing on Monday, a 7-1 loss to the Rays, and the team is leaning toward shutting him down for the rest of the season.